I've been on the hunt for a good, quality pair of flat brown boots for some time, and haven't found many without too much detailing or heel. Maybe I'm looking in all the wrong places? Most of the above are an investment, but they're the best I've found or tried by far! I think the Madewell ones are my fav out of all these - great pick! Such a good investment! A pair from Madewell will last forever. I have a pair of brown boots that I wear all the time; they're starting to fall apart from years of wear. Might be time to consider some of these! Ooh, nice! 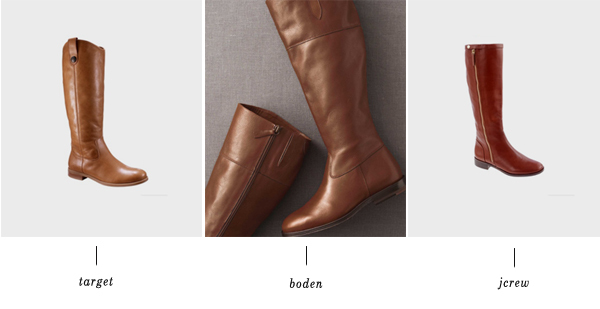 I'd love some plain brown boots. i swear by jcrew shoes. especially their boots. i always buy them on sale and they last for years and are *so* comfortable/chic. 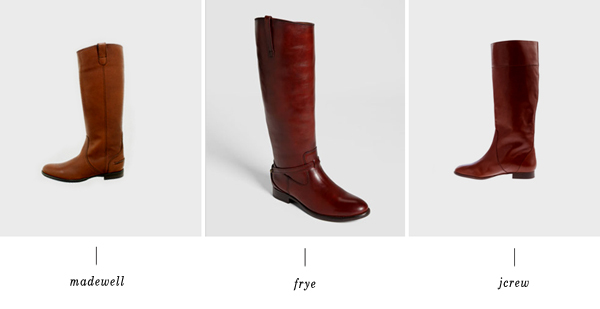 Own the JCrew booker boots. Classic as they come. Make the investment, then take them to a cobbler and add some taps (not sure if that's actually what they're called) on the sole at the heel and toe and get a good leather protector. Your added investment will be under $20, but will give them a long life.